Learn overall Japanese (all 4 skills reading, writing, listening and speaking with accurate pronunciation). 10-15 students per class; less than most schools. More effective study and connections with students and teachers. Dormitory and apartment option offered by the school; details below. You can also decide to organise your own. You will be able to listen to conversation by native Japanese speakers. Teachers speak Japanese at normal speed. 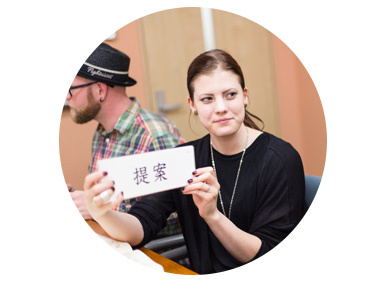 Activities help learners to better understand Japanese, even outside of the classroom. You will be able to talk about a certain topic after a year of study. Only Japanese is used within the walls of the school. Original and unique teaching methods are employed. You will be able to speak Japanese in daily life level in three months from beginner level. Learn easy reading from the beginning. You will be able to write original stories after a year of study. You will be able to write several paragraphs by the end of the course. -School events such as sporting, international cultural exchanges, cultural activities and Hiroshima tour. Total price includes registration fee, visa processing fee, class tuition fee and textbooks. Health insurance fee, accommodations fee and your travel tickets are not included. The dormitories offered by the school are located 5-10 minutes away. Each dormitory has 2-3 bedrooms, a kitchen/dining area, a bathroom, and a toilet. You can use one bedroom by yourself (private) or you can share one with another student (shared). Meals are not included. The apartment is fully equipped with furniture and appliances including internet service. Note 1) Above total fee includes monthly utilities (water, gas and electricity bills) and Internet access fee. Note 2) $255.00/year for National Health Insurance is required by Japanese law. Note 3) Above total fee may change without a notice due to daily currency exchange rate. This school has their intake in April and October each year. You must apply 6 months before for long-term courses, due to student visa immigration processes. We can guide you through this; please inquire as soon as possible. For getting into vocational college from beginner Japanese level, a 2 year course starting April is highly recommended. This is to graduate in March and enter the vocational school in April as this is when most schools have their intake. Please inquire for personal guidance on starting terms, duration and requirements, as it depends on the individual. Minimum requirement for student visa: 1,000,000 JPY savings available in a bank statement. This is required to prove to the school and immigration that funds are available to pay for tuition, accommodation and living expenses for a year.